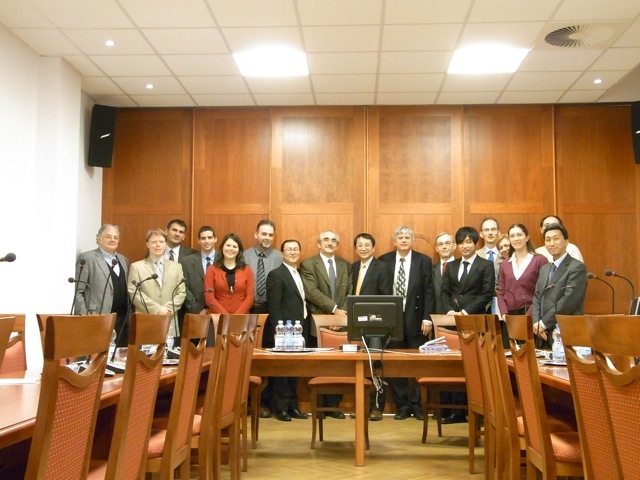 January 16-17, 2012, a workshop was conducted between representatives of the University of Tsukuba and representatives of the City University School of Medicine Szeged in Szeged, Hungary. Topics of discussion included the future cooperation of the two schools and the introduction of the University of Tsukuba’s Ph.D. program in Human Biology. Two students from Chungnam University came to the University of Tsukuba hospital as part of a training exchange program. Hee Sung LEE and Kyung Min KO will stay from January 22 until February 4, 2012. Ko’s specialization is pathology and hematology and Lee specializes in the gastroenterology. Students from the University of Tsukuba are scheduled to participate in training in the field of otolaryngology at Chungnam University. 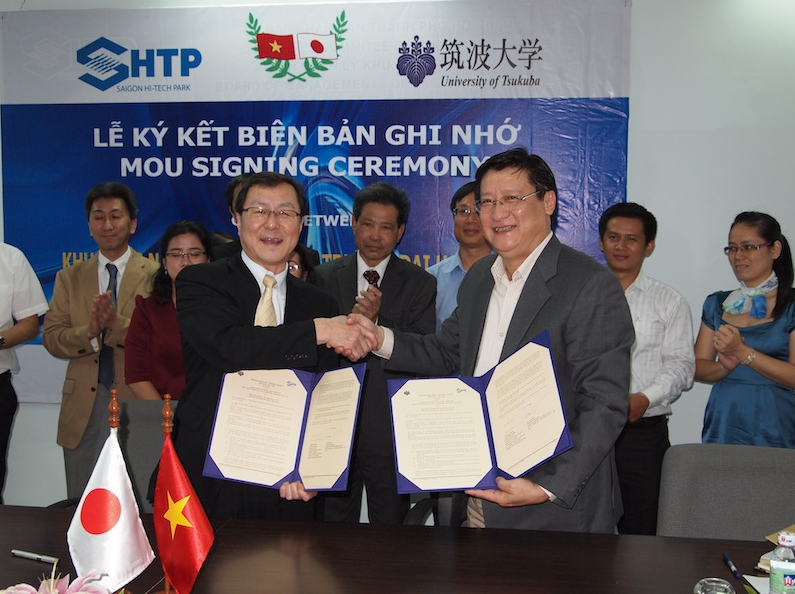 On January 13, 2012, representatives of the University of Tsukuba signed a Memorandum of Understanding on Academic Cooperation in the area of human biology with Saigon Hi-Tech Park. 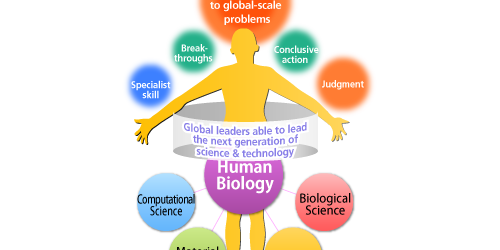 By this cooperation, both sides agree to implement a joint education program on the area of human biology in 2012. Our plan is to target students and graduates of the University of Vietnam, to conduct courses with instructors from the University of Tsukuba. Both sides have also agreed to establish a joint laboratory, with machinery and equipment provided by the University of Tsukuba. 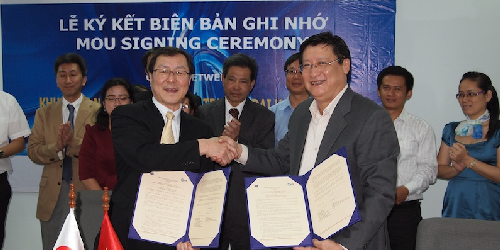 An article regarding this agreement was included in the Saigon Times. For more information please see link below. From April 2012, the University of Tsukuba offers a new doctoral program integrating the disciplines of biological science, medicine, computational science, and materials science. Professor Kyosuke Nagata is the program’s practical coordinator. Support for the Human Biology Ph.D. Program comes from Japan’s Ministry of Education, Culture, Sports, Science and Technology (MEXT). The University of Tsukuba, located about 75 km north of Tokyo, has partnerships with universities in several countries including the United Kingdom, Vietnam, Taiwan and Germany. The establishment of this degree program at the University of Tsukuba will prepare graduates to satisfy the growing international need for research in the area of human biology, and is designed to train scientists to work as part of an interdisciplinary team to address global scale challenges. For more information on the Ph.D. 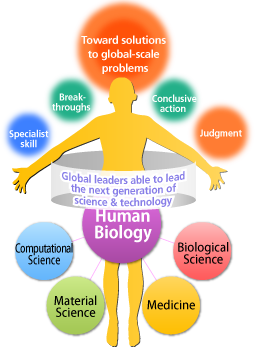 Program in Human Biology, including application guidelines, please consult the program website. This Summer School program is a platform for intellectual communications between Japan, Taiwan and Vietnam to enhance the mutual understanding and cooperation between these countries. In addition, our Career, Culture and Networking programs are great opportunities for students and professors to explore the rich culture resources in Japan and help them establish careers in an international arena. - Graduate students of participating universities who have completed at least one semester on campus before the start of their exchange program. - Applicants who are in good academic standing and meet any additional admissions criteria specific to the exchange program. - Individual with intrinsic motivation and desire to complete research projects in medical sciences. This year, 11 students from National Taiwan University and 10 students from partner schools in Vietnam were chosen to participate in the summer school. © Copyright 2014, International Office, Faculty of Medicine, University of Tsukuba . All Rights Reserved.